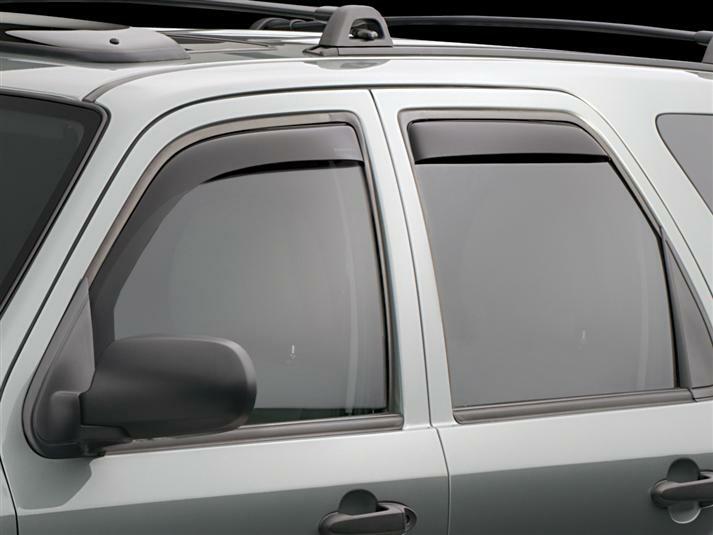 WeatherTech Side Window Deflectors are precision-machined to perfectly fit your 2005 Ford Escape's window channel. These low profile window deflectors help to reduce wind noise and allow interior heat to escape. Our light tinted Side Window Deflectors are the only deflectors in the world made with a D.O.T. (U.S. Department of Transportation) approved glazing material. Available in light and dark tint for most vehicles. Designed and Engineered in USA – Handcrafted in Germany. Although this is a review of the FloorLiner product in my 2016 Ford Escape, over the years and different vehicles I have purchased the FloorLiners, Cargo Liners, TechShades, side window deflectors, and No Drill Mud Flaps for Ford Escapes, Expeditions and Explorers. In EVERY SINGLE CASE the product has been exceptional. Well made, heavy duty, and a PERFECT fit in every vehicle I have used them in. Are they more expensive then other products out there? Yes they are, BUT WORTH EVERY EXTRA PENNY!!!!! I can't express enough just what high quality products these are, For my last three vehicle purchases, WeatherTech is the first site I went to for protection of my new vehicle. Anyway, each set of FloorLiner has been a perfect fit and actually covers more area than stock liners. An overall amazing product that I will never do without! Although there are no pictures to go along with my story, I feel as though using your Window Deflectors on a 1998 Dodge Dakota, 2001 Ford Expedition, and now my new Ford Escape, makes me a great salesman for your product. I tried the stick on type of deflectors and they just dont compare to the weathertech brand. I have recommended these to friends and relatives and they love the product.